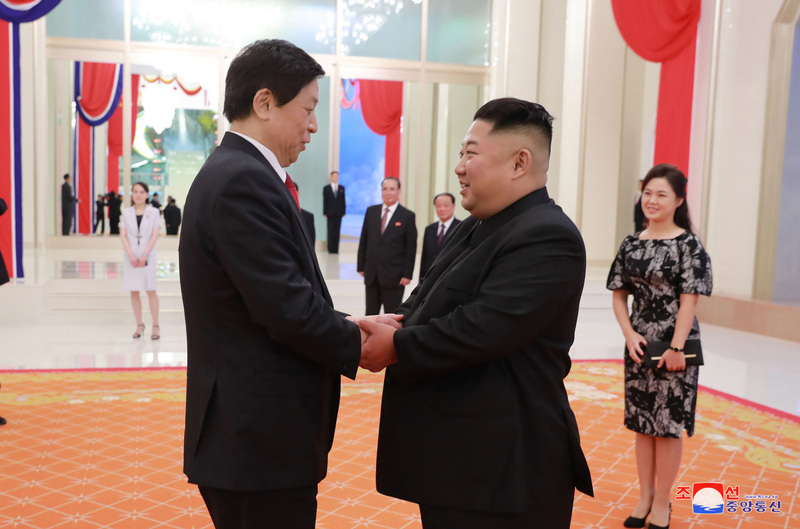 Kim Jong Un shakes hands with Li Zhanshu prior to attending a concert at Mansudae Art Theater in Pyongyang on September 10, 2018 (Photo: Rodong Sinmun). 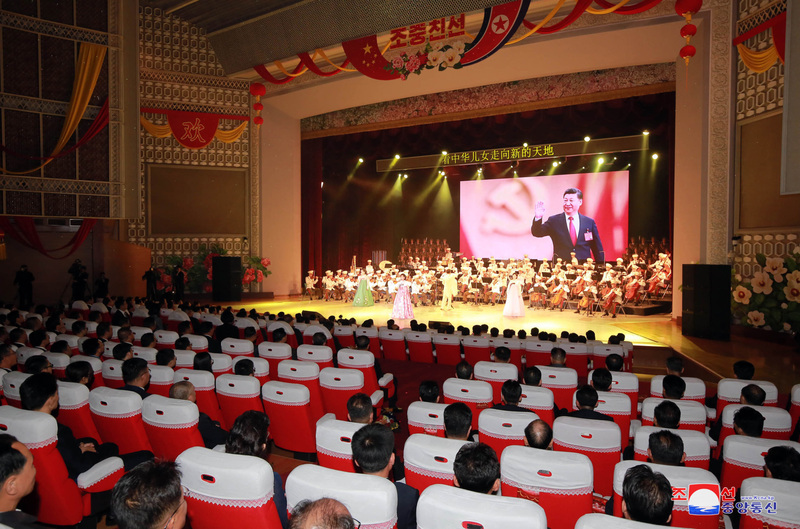 Kim Jong Un (Kim Cho’ng-u’n) and his wife Ri Sol Ju (Ri So’l-chu) attended a concert at Mansudae Art Theater and arranged a banquet at the Workers’ Party of Korea [WPK] Central Committee Office Complex in central Pyongyang on September 10 (Monday) for National People’s Congress Chairman and Communist Party of China [CPC] Political Bureau Standing Committee Member Li Zhanshu. 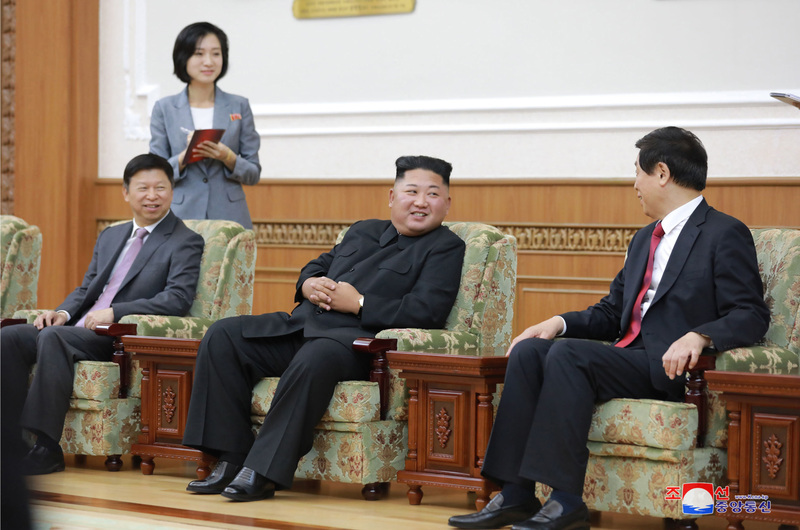 Also in attendance were WPK Vice Chairman and State Affairs Commission Vice Chairman Choe Ryong Hae (Ch’oe Ryong-hae), WPK Vice Chairman and WPK Propaganda and Agitation [Publicity and Information] Department Director Pak Kwang Ho (Pak Kwang-ho), WPK Vice Chairman and International Affairs Department Director Ri Su Yong (Ri Su-yo’ng), WPK Vice Chairman for Science and Education Pak Thae Song (Pak T’ae-so’ng), WPK Propaganda and Agitation Department Senior Deputy Director and Personal Secretary deputy chief Kim Yo Jong (Kim Yo’-cho’ng) and KJU and RSJ’s Chinese language interpreters working in the Personal Secretariat, along with CPC International Liaison Department Chief Song Tao and PRC Ambassador to the DPRK Li Jinjun. 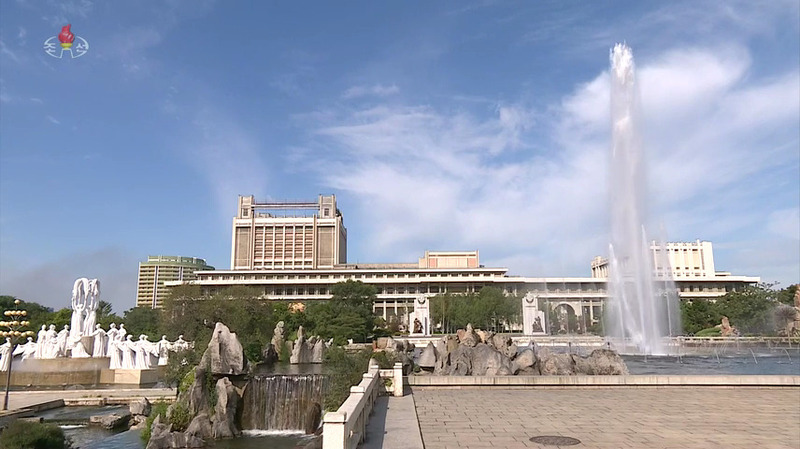 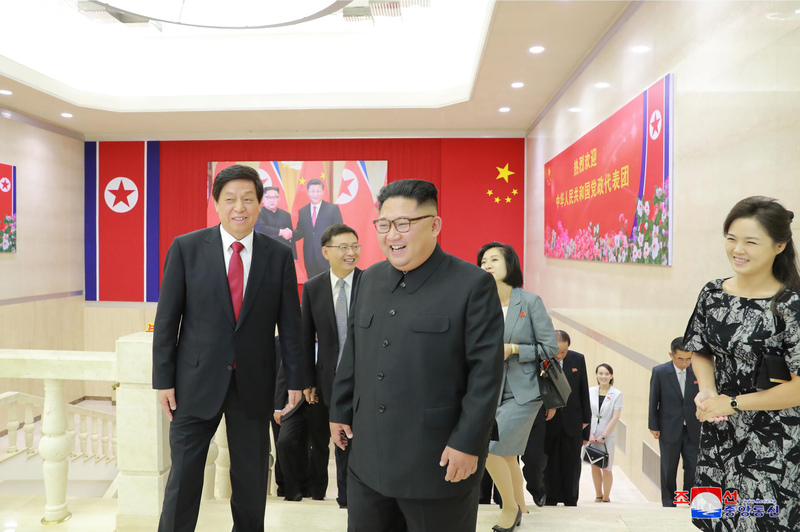 Also coming out for the events were foreign service personnel and other staff of the PRC Embassy in the DPRK, as well was senior DPRK officials such as Hwang Pyong So (Hwang Pyo’ng-so’), Jo Yong Won (Cho Yo’ng-wo’n), Han Kwang Sang (Han Kwang-sang), Ma Won Chun (Ma Wo’n-ch’un), Kwon Hyok Bong (Kwon Hyok-bong) and Ri Yong Rae (Ri Yo’ng-rae). 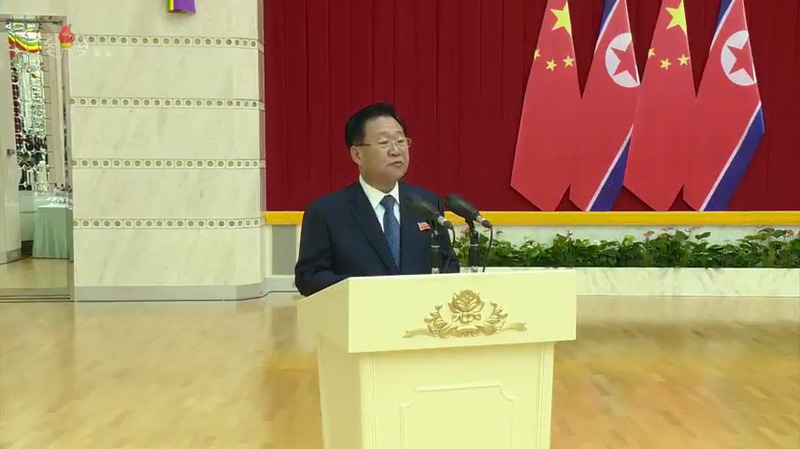 Kim Chang Son (Kim Ch’ang-son) directed the events. 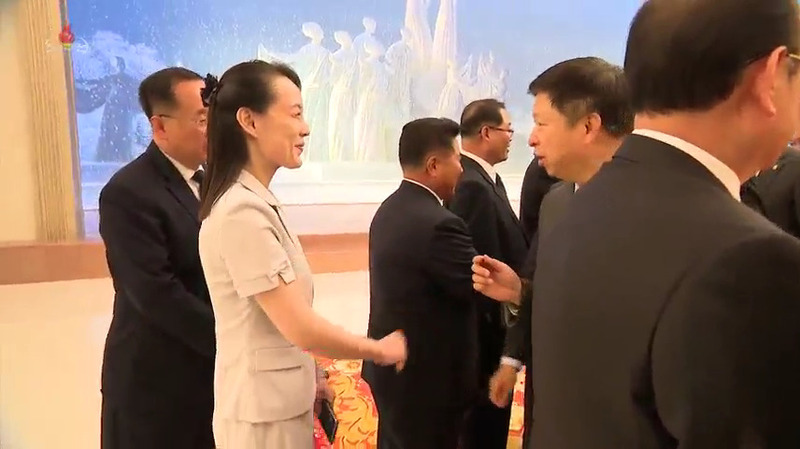 Kim Jong Un and Ri Sol Ju received the PRC delegation in the lobby of the Mansudae Art Theater. 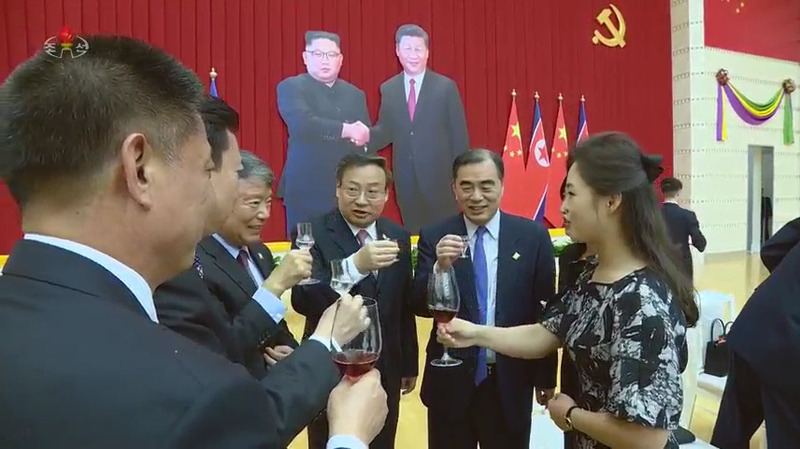 They exchanged “warm greetings” and posed for commemorative photos. 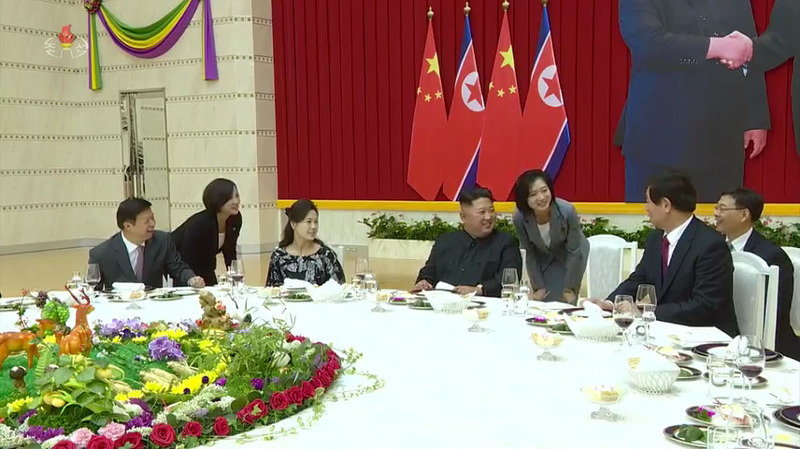 After this, they had an “amiable talk” in a reception room. 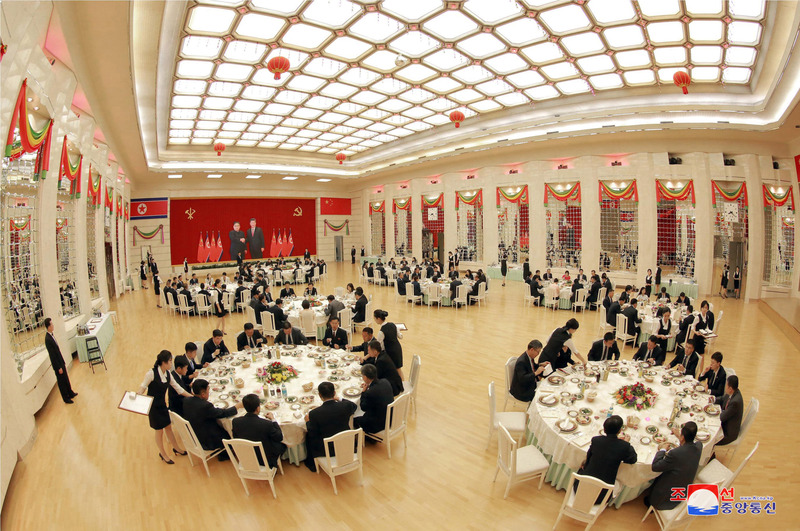 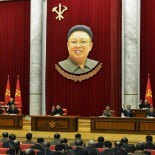 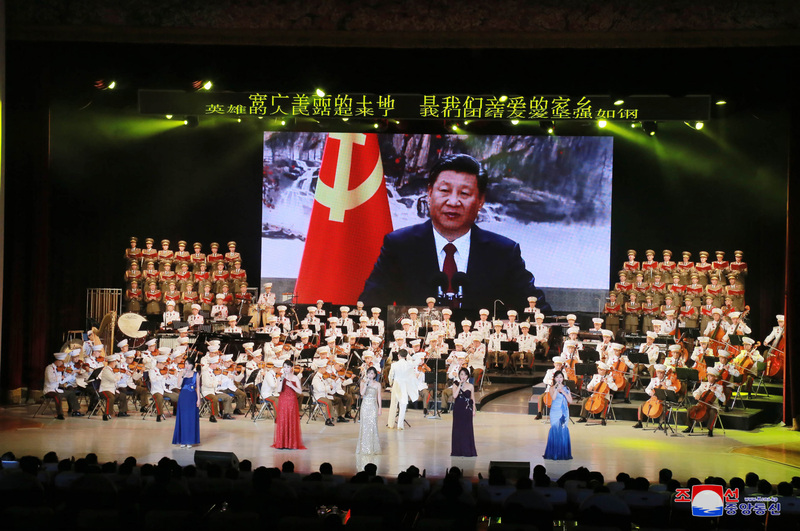 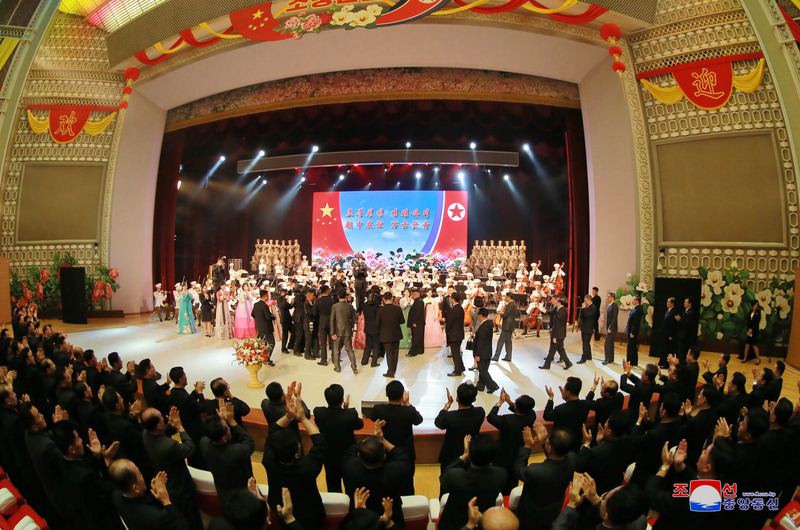 After the concert, Kim Jong Un hosted a banquet to honor Li and the Chinese delegation. 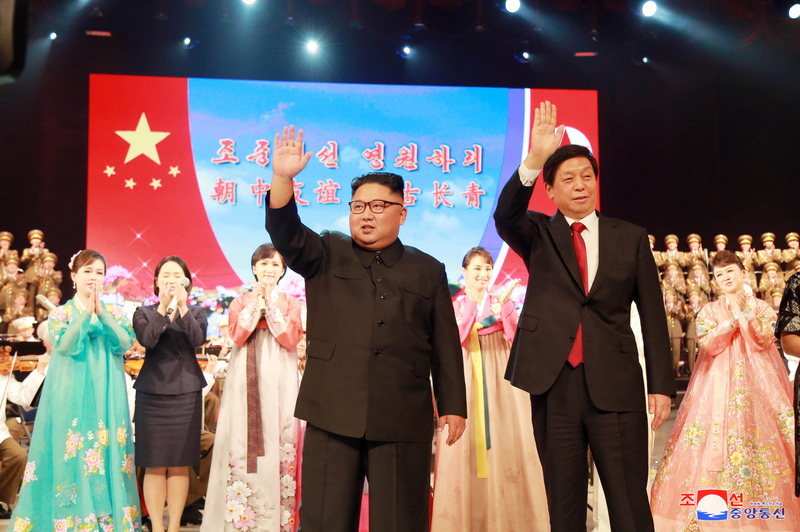 This article was written on 12 Sep 2018, and is filled under Central Broadcasting Committee, Central Committee, Central Military Committee, Central Party Affairs/Cadres 5th Section, Choe Ryong Hae, Culture Section (bureau), DPRK 70th Anniversary (September 9, DPRK Cabinet, DPRK Diplomat Corps, DPRK External Relations, DPRK Intelligence Community, DPRK-China Relations, Events Management Section, Executive Policy Bureau, Finance and Accounting, Foundation Day (September 9th), General Affairs, Guard Command, Han Kwang Sang, Hwang Pyong So, Hwang Pyong So (GPD; KPA VMAR), ideological slogans, International Affairs Department WPK, International Department, Jo Yong Won, Kim Chang Son, Kim Chong-un inspections, Kim Family, Kim Jong-il, Kim Jong-un, Kim Sol Song (Kim Sul Song), Kim Yo Jong, Kim Yo-chong, KJI Personal Secretariat, KJI-Ko Yong Hui Family, Korean People's Internal Security Forces, Korean People's Army (KPA), Korean Workers' Party (KWP), kpif, Kwon Hyok Bong [PAD], Ma Wo'n-ch'un (AD), Main Office of Adjutants (Central Party Office #6), Mansudae Art Troupe, Ministry of Culture, Ministry of Foreign Affairs, ministry of people's security, Ministry of State Security, North Korean press, Organization and Guidance Department, Pak Thae Song (KWP CC Dept), party life, Political Bureau, primary party committees, Propaganda and Agitation Department, Publication Guidance Bureau, Pyongyang Defense Command, Ri Chol, Ri Sol Ju (Kim Jong Un's wife), Ri Su Yong, Ri Yong Rae, Secretariat, State Affairs Commission, State Security Department, Workers' and Social Organizations, WPK Economic Affairs Dept.